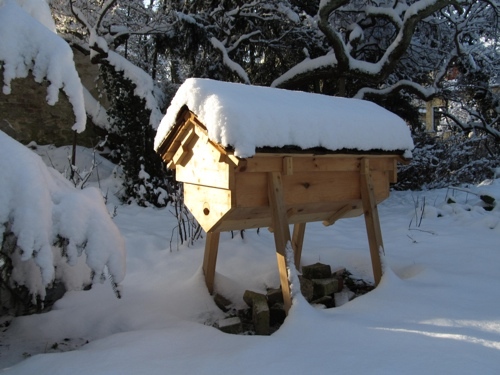 How will you be providing a way up for the bees? Are you leaving a gap between current top bars, or drill holes that can be plugged up? extremely amateur I know but they may work. I was considering only including them above the honey area. This way there is no large gap left above the brood to result in loss of heat and scent. I release this wouldn't "drive" them to build comb and put stores up there but if there is sufficient flow I thought they still might. Have I got the wrong end of the stick? 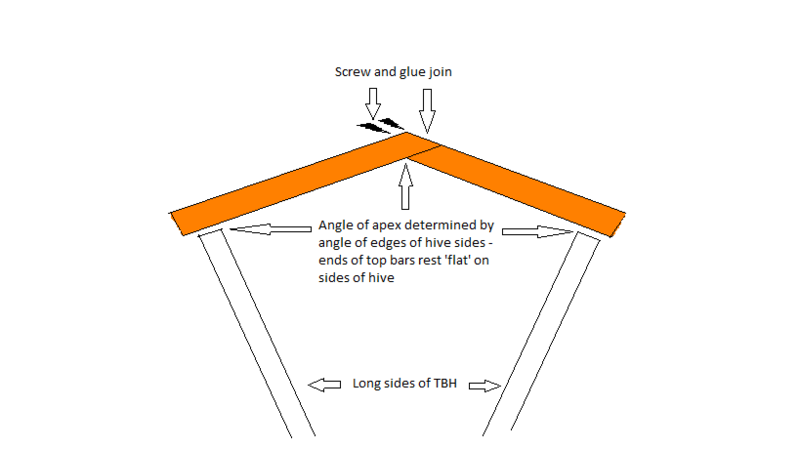 With my limited woodworking skills, I was wondering much the same as Phil - how I could make top bars that would (1) be a more 'natural' shape for the bees than flat bars, (2) be easy to put together, (2) discourage cross-combing and (3) give a greater surface area for the comb to bond to. This is a representation of how the bars would sit on the top of the hive. Pardon my higgorance, but when you make spacers for the barn-roof style top bars, I presume they have to be the same profile? Posted: Wed Jun 25, 2014 10:56 pm Post subject: Followers - clarification please Phil! Okay, so I'm building my TBH with barn-roof top bars. The follower boards need to be cut to the same profile, clearly, but my question is, how are barn-roof followers supported in the absence of the top bar from which 'normal' followers hang? Do they just rest on the sides and floor of the hive? If so, how are they stabilized horizontally? Won't they just fall over? I am using 18mm exterior grade ply sheet to make my followers. I couldn't get hold of 25mm,which may have been thick enough to balance itself. I'd appreciate your thoughts on this as I'm poised with the saw and want to get on without ruining a decent bit of plywood. I haven't experimented much yet, but consider using standard followers with the top section standing on the bar. Still working out the best way to support them, but there are several possible options. Thanks, Phil! That sounds a sensible idea and do-able even for me. Hivehead, as I look at your diagrams, it seems to me that the single point of contact at the end of each of the top bar spars in the centre will be insufficient to keep them from collapsing and splaying outwards You only need to look at how house roof spars are constructed to see how they overcome that problem. Trouble is, that solution would not work as for top bars because the cross members would get in the way. A secondary issue is how you keep the comb-laden bar from not being unstable and flipping over onto its side. Especially so when the comb is just being started in the top center, thus making the comb's centre of gravity be at the top, in turn causing the comb to have a tendency, in the absence of the bars to the side of it holding it in place, from completely flipping upside down. This would become less of an issue as the comb was built down as this would shift the centre of gravity downwards over time. Still think this is over-complicating something delightfully simple! These bars replace the standard bars, not sit on top of them. 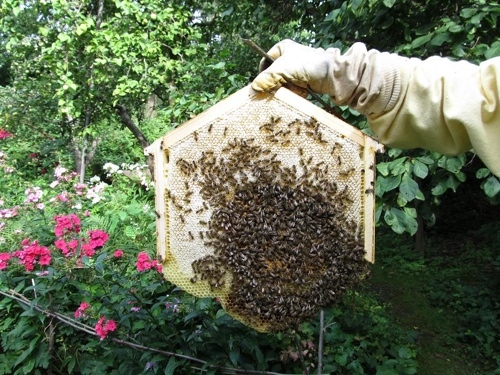 So nothing like supering, as the bees start at the top and work downwards, as usual. I have some of those bars with removable parts, which are very useful for adding a top feeder. I have had little success in supering a TBH so far, as bees seem to need free access above the bars before they will consider building comb up there, and you definitely need some sort of 'ladder' arrangement, or they get very creative with their comb-building. I think there are two unique aspects of Phil’s arched top bar idea that exhibit good out-of-box thinking. I see how one derived from his Pagoda hive, and that is the concept of a series of identical 2-dimensional frames stacked together to form a 3-dimensional container. In the Pagoda hive the container (the hive) consists of horizontal frames stacked vertically. With this hTBH variant the whole arrangement is turned 90 deg. around—vertical frames are stacked horizontally giving a vault. I’d bet a large Cornish pasty (which I’ve only had once, alas, but fervently hope to acquire and sink my teeth into before I die. *sigh*) that this is roughly the thought process he followed which resulted in this idea. Only he can confirm. The other co-idea is giving the frames a shape that approximates with straight lines (hence easy to construct from wood) some sort of arch, thereby creating a tunnel vault when all stacked together in a row. I think it’d be more fruitful if, rather than getting bogged down in secondary and tertiary issues like joint details (which admittedly can make or —um—break the whole design), we stay focused on these two key aspects to see how they can be further developed. F’rinstance I see an irregular pentagonal or hexagonal straight sided approximation to an oval (i.e. 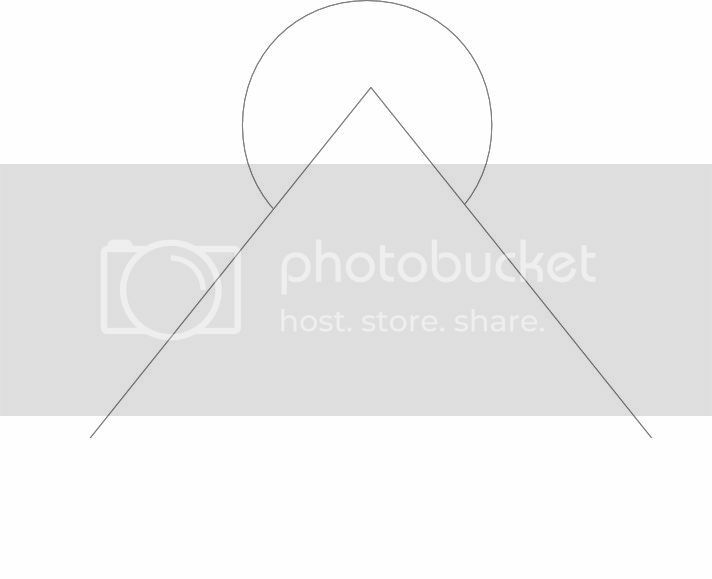 an egg-shape, not an ellipse), little end down, consisting of two lower steepish sides, and two upper, rather flat sloping sides, each joined to the other, (thereby forming a peak), or joined to a fairly short horizontal top piece. The bottom “side” would be omitted, or be provided by a bio-sump which Phil has promoted elsewhere. The whole rack of frames could easily be contained in a tray of some sort with taller ends that would constrain the entire stack/rack from, well, racking over domino fashion. Such a “tray” could be no more than a skeletal, minimalist affair. As he indicates, toss something of a covering over the whole shebang and you’ve got a dandy hive. In addition, Phil has hinted at proportions that yield a considerably shorter and taller hive (i.e. fewer, taller frames) than is typical for hTBH’s. Food for thought here. If I weren’t so involved with my own experimentation with a Warré/Perone hybrid design, I’d be all over this like white-on-rice. Slightly off topic, but have you got any pictures of this ? Cut a strip of ply 8 feet long and the width you require for the top bars. 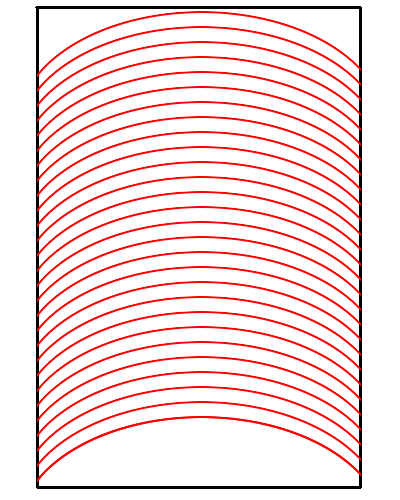 For Phils design, the strip would be 432mm (17in) wide. Set up a jig to cut 66 eliptical curved pieces of ply out of the strip, as in the following image. By my rough reckoning, if you cut each strip 33mm thick, you'd get 66 of these strips with an arch height of 130mm on each one. That allows for a 2mm saw kerf. Cut 33 strips of wax foundation to the same shape as the wooden strips, but a few mm thinner, maybe 30mm wide. These strips will only need to be about 350mm wide. Now make 33 sandwiches, each sandwich is made of a 18mm ply strip (red), a wax foundation strip (yellow) and another 18mm ply strip. 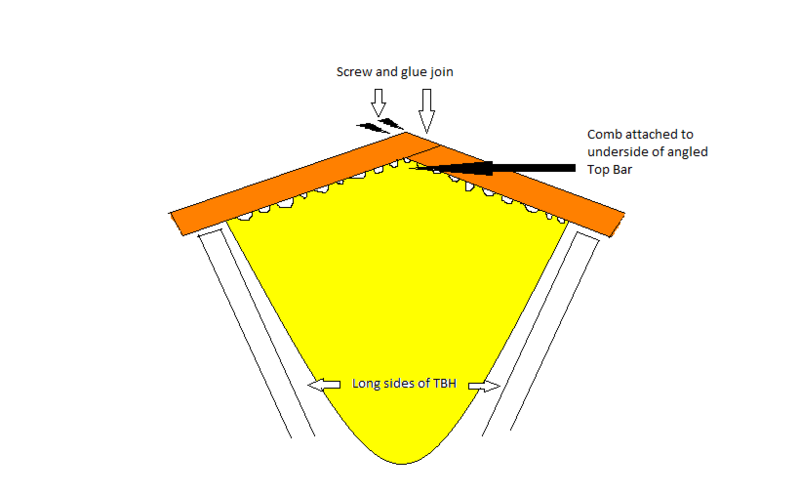 A line of wood glue (grey) can be used on the outside of the arch and the wax foundation can cover the inside of the arch with a few mm protruding below it. A blob of wood glue can be used on the ends where there is no foundation and 30mm pins can bind the whole thing together until the glue sets. Each sandwich should be about 37mm thick, the perfect thickness to fill a 4' TBH with 33 of them. The ends of these bars might benefit from a quick polish with a router or sander to make the shape of each half of the sandwich match each other perfectly. I think this would overcome any problems people have mentioned regarding the joints used in an arched topbar. Preventing the bars from tipping over should be possible if the hive is filled with these bars. Each bar supports the bars on each side of it. Once the bees have built their comb , the centre of gravity will be below the hanging points at each side. edit: It's important to note that alot of the 18mm plywood on sale these days is actually 16-17mm plywood. Old stuff reclaimed from older projects is actually 18mm thick, but you're unlikely to get it in full sheets anymore. I am using a modified Top Bar in a hexagonal hive since 2013 with some success. Please contact for further Information, for posting links is not allowed for me. Or try Zehlendorfer Trog with google. nice that you made it here! Do you want me to post pictures of your hive design? Gorgeous that shape will help condensation flow down the sides instead of dripping. Im not sure my carpenter skille are so advanced. It is cut from a single piece of 38mm by 65mm wood. Rip into into three. I have a lathe so I turned the middle piece, but this could just be a dowel with the end pieces stuck on.